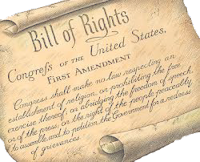 1) Congress … this indicates that only the United States Congress has the power to alter our unalienable rights. This said, the Bill Of Rights (or the first ten amendments to the constitution), is a clarification of what our God given rights are. These rights are presented in CLEAR language. The Bill Of Rights is a list of rights that not even the United States Congress can "toy with". 2) shall make no law … it doesn't get any more poignant than that. NO LAW can be made that would infringe upon these rights enumerated in this amendment. 3) respecting an establishment of religon, or prohibiting the free exercise thereof … That is to be said all together - it's not two sentences. "Well, there's the whole separation of church and state part." Do you see anything remotely close to the words "separation of church and state"? The Danbury Baptist Association of Danbury, Connecticut sent a letter, dated October 7, 1801, to the newly elected President Thomas Jefferson, expressing concern over the lack in their state constitution of explicit protection of religious liberty, and against a government establishment of religion. "Our Sentiments are uniformly on the side of Religious Liberty — That Religion is at all times and places a matter between God and individuals — That no man ought to suffer in name, person, or effects on account of his religious Opinions — That the legitimate Power of civil government extends no further than to punish the man who works ill to his neighbor…"
As a religious minority in Connecticut, the Danbury Baptists were concerned that a religious majority might "reproach their chief Magistrate... because he will not, dare not assume the prerogatives of Jehovah and make Laws to govern the Kingdom of Christ,"
"...I contemplate with sovereign reverence that act of the whole American people which declared that their legislature should 'make no law respecting an establishment of religion, or prohibiting the free exercise thereof,' thus building a wall of separation between Church & State." This doctrine, which has become known as the "wall of separation" or "strict separationism," would later become highly influential in 20th century Supreme Court understandings of the relationship between church and state. The letter is nothing more than a historical outlier. It is not law. wikipedia: wall of separation of church and state. Separation of church and state is a bedrock principle of our Constitution much like the separation of powers and checks and balances. In the Constitution, the founders did not simply say in so many words that there should be separation of powers and checks and balances; rather, they actually separated the powers of government among three branches and established checks and balances. Similarly, they did not merely say there should be separation of church and state; rather, they actually separated them by (1) establishing a secular government on the power of "We the people" (not a deity), (2) according that government limited, enumerated powers, (3) saying nothing to connect that government to god(s) or religion, (4) saying nothing to give that government power over matters of god(s) or religion, and (5), indeed, saying nothing substantive about god(s) or religion at all except in a provision precluding any religious test for public office. Given the norms of the day (by which governments generally were grounded in some appeal to god(s)), the founders' avoidance of any expression in the Constitution suggesting that the government is somehow based on any religious belief was quite a remarkable and plainly intentional choice. They later buttressed this separation of government and religion with the First Amendment, which affirmatively constrains the government from undertaking to establish religion or prohibit individuals from freely exercising their religions. The basic principle, thus, rests on much more than just the First Amendment. That the phrase "separation of church and state" does not appear in the text of the Constitution assumes much importance, it seems, to some who mistakenly supposed it was there and, upon learning of their error, reckon they’ve solved a Constitutional mystery. To those familiar with the Constitution, the absence of the metaphor commonly used to name one of its principles is no more consequential than the absence of other phrases (e.g., separation of powers, checks and balances, fair trial) used to describe other undoubted Constitutional principles. To the extent that some nonetheless would like confirmation--in those very words--of the founders' intent to separate government and religion, Madison and Jefferson supplied it. Some try to pass off the Supreme Court’s decision in Everson as simply a misreading of Jefferson’s letter to the Danbury Baptists–as if that were the only basis of the Court’s decision. Instructive as that letter is, it played but a small part in the Court’s decision. Rather, the Court discussed the historical context in which the Constitution and First Amendment were drafted, noting the expressed understanding of Madison perhaps even more than Jefferson, and only after concluding its analysis did the Court refer–once–to Jefferson’s letter, largely to borrow his famous metaphor as a clever label or summary of its conclusion. The notion, often heard, that the Court rested its decision solely or largely on that letter is simply wrong.